The Bamix Professional is small but very powerful. This ultimate immersion blender offers a 150 watt motor that will deliver high performance & versatility for the home cook, making every blending task faster and more efficient. Whatever the task may be, pureeing to make soups, aerating, beating egg whites, whipping cream or chopping fruits & vegetables you will be amazed how fast and easy it is. The dry chopper will grind sugar cubes to powdered sugar in seconds. The maximized torque increases the blade rotation for smooth and steady blending for thicker mixtures. For easy cleaning, rinse the blending shaft attachments under warm running water. The mincing blade will chop, mince, puree raw & cooked vegetables, fruit, berries, baby food, cooked meat, frozen fruit for ice-cream and more. The beater attachment aerates, beats, blends egg-whites & cream and is used to whip up soups, sauces and everything that should be light & fluffy. The whisk blade will stir, mixes shakes, drinks, purees, blends salad dressings, and will makes mayonnaise. This attachment will mix thick or creamy consistencies. 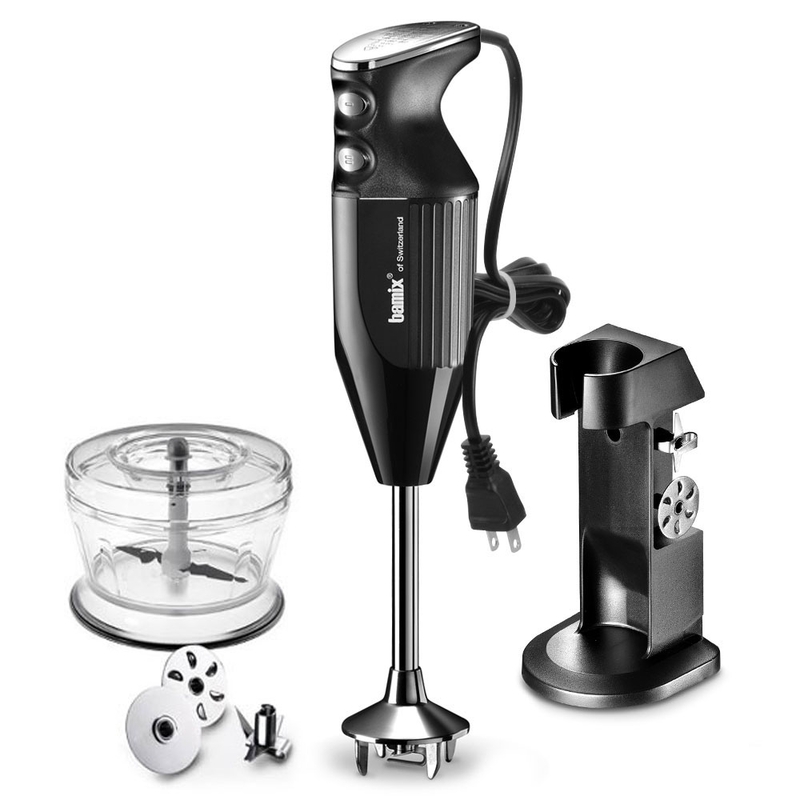 https://www.cutleryandmore.com/bamix/deluxe-m150-immersion-blender-set-p125966 25966 Bamix 150 Watt DeLuxe M150 Immersion Blender Set https://cdn.cutleryandmore.com/products/large/25966.jpg 179.9500 USD Discontinued // The Bamix Professional is small but very powerful. This ultimate immersion blender offers a 150 watt motor that will deliver high performance & versatility for the home cook, making every blending task faster and more efficient. Whatever the task may be, pureeing to make soups, aerating, beating egg whites, whipping cream or chopping fruits & vegetables you will be amazed how fast and easy it is. The dry chopper will grind sugar cubes to powdered sugar in seconds. The maximized torque increases the blade rotation for smooth and steady blending for thicker mixtures. For easy cleaning, rinse the blending shaft attachments under warm running water.